One of the most common means of communication with God is through prayer. 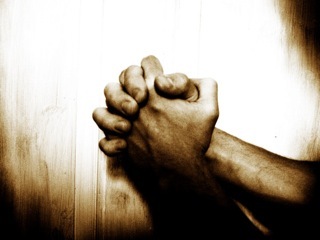 As God’s people, we are even called to pray continually, or without ceasing (1 Thessalonians 5:17). I suppose most are aware that this kind of call to prayer does not intrinsically include the necessity of closing our eyes, nor folding our hands or bowing our knees. These actions aren’t wrong, but they are not the way of prayer. Life doesn’t allow for such postures at all time, but because God Himself resides within believers, the door has been opened for constant and consistent prayer. Still, at times, prayer simply becomes something like a rote response or simply a cognitive exercise (whether we are praying aloud or not). That’s one scenario, but the ‘prayer response’ can be very similar across the board. And I do believe there is a problem if our prayer life simply consists of a cognitive response. But what I sense in a lot of our prayers, or at least my prayers, is that we launch into praying without ever looking to be directed by the Spirit. Our prayers are simply our words and our words alone. I’m not sure that is a very healthy way to approach prayer. A possible sign of this is when we start our prayers off with some statement like this: ‘God, thank you for this day.’ There is nothing wrong with such a statement. Matter of fact, we should be thankful for this day. That’s a good place to start. There is plenty of Scripture to back up a statement. But, usually when we make such a statement, I find that we might not really be engaging with God in the activity of prayer. There’s nothing much there, if you will. And if that is the case, we need to be challenged. If anything, the Holy Spirit knows how to pray, since He knows the will of God, the heart of God. It might be good that we be specifically directed, led, guided and stirred by Him in our prayers. Matter of fact, I think we are called to being directed by the Spirit in all matters of life. That might just be what walking in the Spirit is. And a good place might be to start with our praying. But, to try and clarify even more, I will give a personal example in my life that happened in recent weeks. Some will know that I live in the Brussels, Belgium, area. Here, my family and I live in an apartment. But, whereas in America there is lots of space, there isn’t so much here. So everything is crammed together and everything is smaller. While in America they build their buildings outward, in Europe they build their buildings upward, so as to conserve space. In our apartment, on the other side of my wife and I’s bedroom, we have our neighbours. Actually, it is the bathroom of the neighbours (which is mainly the bath-shower, sink area). For some unknown reason, our neighbours love to congregate in their bathroom. It seems they have their deepest discussions there. I’m not saying you can’t do that, I’m just saying it seems like all the time, especially since we are right on the other side. And they both don’t have the quietest of voices. So, at times, my wife and I have joked about joining in their conversation, answering a question through the wall to see what might happen. And, not only do they have deep conversations in their bathroom, but they also have their loudest and most intense arguments there. Well, even if it weren’t in the bathroom, we can normally here it wherever it takes place, due to their extremely loud voices. So things had reached a pinnacle of frustration. I had tried visiting them one day to graciously let them know we have a small baby and that we are just on the other side of their bathroom. All I was able to obtain was speaking to them through the intercom system (a typical instrument in apartments over here). And, even more recently, we had knocked and I mean knocked hard on the wall to let them know we are just on the other side. One night, with an argument just beginning about 2.00am, I knocked as hard as I could and ended up injuring my knuckles. I had had enough!! Now, here is the thing. We had been praying. But, as you can probably guess, our prayers were more along the lines of, ‘Lord, please help them shut up be quiet tonight so we can sleep.’ We were struggling because we hadn’t had too many good nights sleep in the past months with a newborn and we were simply at our wits end. One night I was sitting in bed. I could have been reading, I could have heard our neighbours at it again, I could have been praying. I can’t remember the exact details of the situation. But I remember the exact details of what happened following that initial moment. Again, it was so clear. I could not mistake the voice of God, His communication to me. I was so sure it was Him that I changed my prayer right then and there, praying as He had shown me how. I also shared with my wife and we began praying according to what God had spoken from that moment forward. I didn’t just one to pray once and that be it. I was looking to pray regularly for them with my wife. The most fascinating thing unfolded over the next couple of weeks. No, unfortunately, I cannot report that they both came to Christ, at least not yet. But the story is nonetheless encouraging, at least for me if no one else. Well, it was. She apologised for all that had been taking place over the past months and how her partner had treated me when I tried to come over. She said she had not realised that this guy was as much of a problem as he was. She was from Poland (he was Belgian) and she would be heading back to Poland the next day. Her partner thought she would be going for a week’s holiday, but she was going for good, not to return. She had come over to get the readings on the metre for the electricity and gas, since it was actually in our part of the building. She was going to have things cut off since it was all in her name. My wife invited her in for some tea, hoping to interact more with her. But, unfortunately, she declined the invitation saying that her partner did not know she was at our place and that she had to get back before he became suspicious. Well, we prayed into the situation, again remembering how God had asked us to pray, and the next day she went back to Poland. We didn’t see here again and we’ve never met the guy. But, ever since then, there has been solid peace for the past 3 or 4 weeks (from whenever she left). Complete peace and quiet, even so much that the guy has only come home about 2 days in this whole time. I don’t know if he has moved out or what, but there have been no arguments, no yelling at 2.00am, none of the sort. Interesting what happens when you pray in accordance with what God is saying. Our prayers were being specifically directed by God. I wasn’t just praying how I thought I should or how I wanted it to go. I was praying as He was leading and speaking. Listen, this is not about boasting in me and my great prayer spirituality. Remember, I wasn’t really even looking for God to speak to me in this. It was simply in a moment when God spoke, communicated and directed me towards change. If anything, this was about His rich grace and mercy. He was fathering me. I am still challenged to be praying into the lives of these two people, even now – for God’s blessing, for their lives, for any kind of hope to rebound off another person, for wisdom for them both if there is a desire to get back together, etc. But, I’m challenged even now to be praying as God leads. Will we always hear God lead us? Probably not, though I wouldn’t put it pass God. But our prayers need to be directed by His Spirit, since the Spirit knows the will of God. I don’t want to just launch in with a nice and eloquent prayer that seems spiritual enough but lacks anything of God’s Spirit at all. What a waste of time. So, even before we pray one word, maybe we should just listen, listen to Him. I can think of know better way to help us in our praying. This entry was posted in God speaking, prayer, revelation and tagged God speaking, prayer, revelation. Bookmark the permalink. Even though I am six days behind in reading this post, the timing of my reading it is absolutely perfect. You see, Romans 8:26-27 have been the fabric of my prayer life for the past 2 weeks. There’s been an interesting convergence of sorts of confrontation of past failures, present pain and future hope. Such that very recently, all I could do was bow before the throne room of God without words but an open heart screaming Romans 8:26-27. I believe he has directed me to pray a certain way, which to my human mind seems very wild and crazy. Yet the burden, affirmed by various unconnected happenings, remains. And even just a while ago, I began questioning again, sat down to work on a paper and felt compelled to check in on your posts that I haven’t read yet. And read this. Thank you dear brother for your heart and words. Awesome, Lisa. I cannot imagine living life without the hope of his specific direction. I don’t always hear, but 99 out of 100 times it is because I don’t take time to listen. Keep praying the prayers HE is stirring. Thanks for sharing.